I’m excited to tell you about my relaxing little holiday on Ontario’s West Coast as part of the Taste of Huron program! I was lucky enough to stay overnight at Brentwood on the Beach, which is a luxury bed and breakfast on the shores of Lake Huron at St. Joesph’s (between Grand Bend and Bayfield). The special Winterlicious package I booked included a traditional German dinner, four star accommodations, and brunch the next day. I had heard about Brentwood before, but I had never had the opportunity to stay overnight before. I had no idea that it was such a large and beautiful property! Peter and Joan Karstens own and operate Brentwood, which is a 10,000 square feet house with 9 guest rooms, a salt water pool, hot tub, sauna, guest kitchen, and common areas with books and games for guests to enjoy. When I arrived, two other guests were curled up on the couch reading a book by the fireplace. The traditional German dinner included rouladen, which was made out of a Metzger’s beef roll made with dijon mustard, pickles, and bacon. Very tender! There were over 15 guests for dinner, and with the floor to ceiling windows in the dining room, many of us watched the beautiful sunset go down over Lake Huron before our meal. Peter is originally from Germany, so we enjoyed an authentic German dinner made by Peter and the Brentwood staff including garden salad, red cabbage, turnip, roasted potatoes, green beans, rouladen, pickle tray, and various breads. Dessert was German black forest cake, which was delicious! I had a chance to chat with Pat and Betty, two ladies from Harriston, during dinner and discovered that these ladies discovered Brentwood on the internet and decided to come for a break from life at home. They also indulged in some in-house pedicures and massages while they were there! The morning after I enjoyed a mini spa-like experience: a dip in the pool and hot tub and a quick visit to the sauna before brunch! 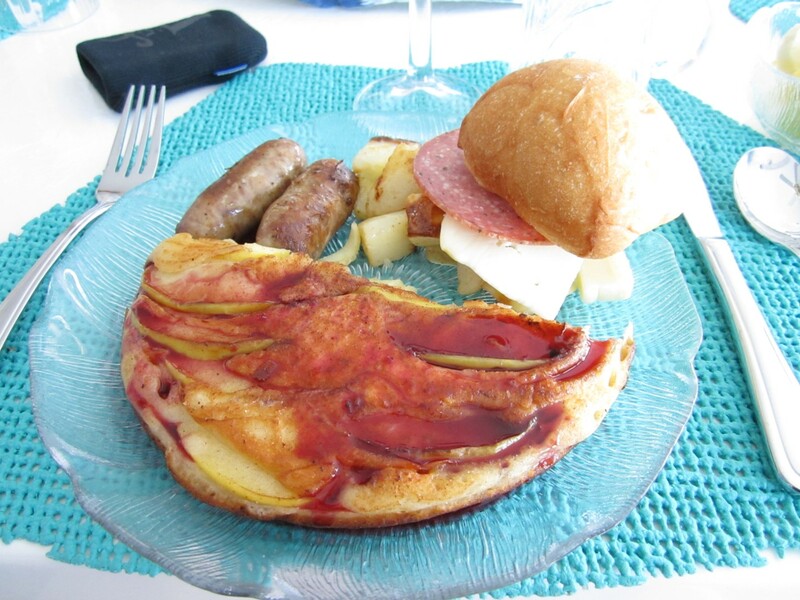 Brunch included Peter’s famous German apple pancakes with homemade mulberry sauce, poached eggs, sausage, fresh fruit, yogurt, cheese and cold meat platter. All I can say is that if you come to Brentwood, make sure you try the pancakes as they are scrumptious! The salt water pool was very warm and with the humidity it felt like the tropics! What I discovered during my stay was that most of the guests were repeat guests. They loved staying there and decided to come back, which speaks volumes about the quality of Brentwood. Stay tuned for another post with some stories about the interesting guests I met during my stay!